I was looking through the list of my Going Paperless posts the other day and realized that I’ve now been writing this column for over two years. In that time the way I use Evernote to go paperless has evolved, and while some of the earlier posts I wrote are still useful, they don’t always reflect how I do things today. So I thought I’d use today’s column to describe some of the ways my use of Evernote to go paperless has evolved over the years. In most of the cases below, I’ve either learned better ways to do things, or found more comfortable ways to do things. Comfort is important because I find that if I am not comfortable with a tool or a service, I tend to shy away from it. These are listed in no particular order, mostly just as they occurred to me as I reviewed the old posts. All of the Evernote Ambassadors were switching, in order to be able to take advantage of the collaborative features in Evernote Business. On a couple of occasions, I found myself getting close to the monthly upload limits in Evernote, even as a premium user. Evernote Business doubled those limits from 1 GB/month to 2 GB/month. I find it to be more and more helpful in my freelance work. One of the first posts I ever wrote for this column was on my process for going paperless in 10 minutes/day. More than two years later, that has dropped to about 5 minutes/day. Actually, even 5 minutes is a bit of an illusion. On any given day, I rarely have to scan anything in, which is what took most of the time two years ago. That said, I have added new steps, like my Daily Review, in which I look at all of the notes created that day, and make sure they are properly filed and addressed. That adds a little time. These day, however, the vast majority of notes that get into my Evernote account get there automatically. Let me illustrate with two days worth of notes. A recent weekday, and a recent weekend. I have annotated the above screen capture of my notes from yesterday. I created 11 notes in Evernote yesterday. Of those 11 notes 8 went into Evernote automatically, without any action on my part. The notes with pink labels beside them are automated. The notes with blue labels beside them are manually entered by me. The three notes that I manually entered included the recent issue of Scientific American (I have a digital subscription and keep all of the PDFs in Evernote), a screen capture that I annotated in Skitch, and a note for an idea for a going paperless column. The rest of the notes were automatic, and came into Evernote via other services. Those notes categorized as “Blog”, “Travel”, “Exercise”, and “Receipt” all came into Evernote through some IFTTT recipe or other. The note marked as writing was sent to Evernote by a custom script I’ve written that sends me a summary each day of my writing. On the weekend day, of the 13 notes that got into Evernote, all but one was created automatically. The only manual note I created on Saturday was the book recommendation. This illustrates just how much information I get into Evernote without requiring any action on my part. And it should help to explain why my process for going paperless is down to 5 minutes per day, despite adding in a daily review. Also, while I prefer writing at the keyboard, there is something to be said for scratching out the words in a notebook. Especially when I know that it will be easy to capture those words in Evernote. That said, I still find myself using the Drafts app for iOS to quickly get notes into Evernote throughout the day. These are typically not the kind of notes I’d whip out the Moleskine for. I have several automations set up in Drafts so that I can easily capture story ideas, article ideas, and append to notes for my work-in-progress. The Drafts app allows me to just jot the note and click a button. It does the filing, tagging, and date stamping for me. I can do it easily when I’m on my daily walks, and that tends to be when I use the app most frequently. These days, if I am out and someone hands me a piece of paper, I use Evernote’s document camera to capture it, and then hand the paper back so that it can be reused, or recycled. I don’t need to carry it around only to toss it or recycle it myself. So, for example, on Sunday, when I took my son to his newest swim lesson class, a staff person gave me a handout while I sat in the bleachers watching the action. I pulled out my phone, opened up Evernote, snapped images of the handout with the Document Camera, and then returned the handout so that someone else could have it. 6. I’ve become a Skitch addict! I probably use Skitch 20 or 30 times a day. Indeed, I make direct use of Skitch more than of the Evernote application. I use it to capture screenshots for application development work that I do. I use it to annotate images and documents. I use it to produce clear instructions. And, of course, I use it to annotate PDFs. I could (and probably will) write an entire Going Paperless post on how my notebook and tag organization has evolved over the last 2 years. But the short version is that I am constantly looking for ways to simplify this. Evernote has such great search capabilities, that the only time I really need organization is to provide a loose framework that separates out the various parts of my life (work life, freelancing, home life, etc.) I’ve reduced the number of notebooks and notebook stacks that I have. I’ve also reduced the number of tags that I use. This has helped save a lot of time. I can still find things just as quickly as ever, but I don’t need to spend time trying to classify and categorize my notes beyond a very simple framework. I found that I never searched for a tweet, and that the thousands of tweet notes cluttered everything else. These days, you can download an archive of all of your Tweets directly from Twitter, so why keep a second, redundant archive in Evernote? Especially when I’m not using it? I’ve looked for other places to eliminate some redundancy as well. This helps to ensure that the stuff I collect in Evernote is stuff that I’m going to want for the long haul, but also stuff that is practical and useful. This is a constantly evolving process for me. I’ve written about how I think of Evernote as a kind of timeline of events. Each note gets a date stamp, and those date stamps paint a picture of events over time. I’ve been using this more and more, especially as my kids get older and encounter more milestones of their own. Sometimes, they are small things, like the last day my kids attended Gymboree, after nearly 4 years of attendance. Others are big things, like when my son graduated from pre-school. For a long time, I never really made much use of the Share Notes features in Evernote. I’ve been using them much more lately. I’ve always shared important notebooks with my wife, so that she can access data she needs, but for one-off notes, I’ve started to use the sharing features in Evernote more than I used to in the past. These are some of the ways that my use of Evernote has evolved over the years. How about you? How has your use of Evernote changed over time? Let me know in the comments. Last week’s post: Quick Tip: Clipping Email with the Evernote Web Clipper. 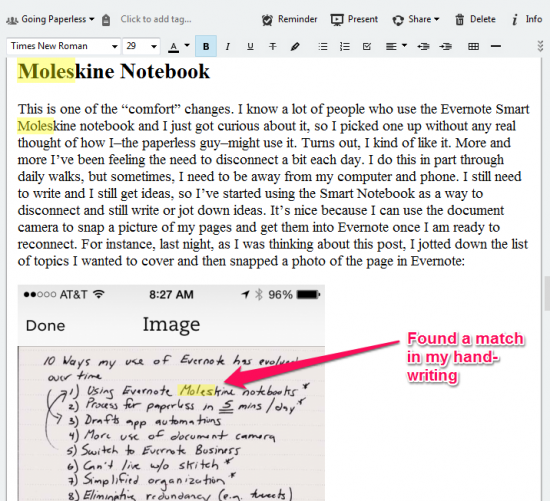 Question about the Moleskin Notebook: Does Evernote convert the words on the written page into text? If so, how good a job does it do? I have been using Evernote for just over a year but have nevertheless seen an evolution. In the beginning I just stored copies of important documents, some web clippings & made notes with attachment of Word & Excel files I already had. Then I got interested in writing, at 1st in blogging, but that did not really satisfy me. So at the start of this year I started a daily journal (a new note for each day) & that really is what I wanted. I am now starting to expand that by a “bottom up” approach, creating notes from the day I was born & working towards the start of 2014. That will take some time complete. These notes are not daily ones of course but record important milestones I can remember & some details about my life then such as kindergarten & primary school. Another one of my pastimes is reading, so I thought it would be nice to make notes as I go along. This does 2 things: it forces me to read more carefully (often a paragraph or chapter gets read 2 or 3 times) which gets me into the book better, and it creates a summary of the book for future reference. If the book has some historical references I can look up some more detail in e.g. Wikipedia & record that in a separate background note. I also decided that my email client is not an archive (even though it can be used as such) & that I wanted to have all my information in 1 central place. So all the emails that are important & need to be kept I forward to Evernote, the rest I delete. Meagan, if I print, it does a pretty good job. Here’s what a search looks like for the term “moles” and note how it finds the text both in the text of the note, as well as the image that contains my handwriting. I love the Evernote Moleskines. I’m a research chemist by trade, and I can’t always have my computer with me for facile paperless notetaking. I’m much more likely to write stuff down on paper when I’m in the lab. Furthermore, hauling laptops to meetings, while standard if one happens to be the presenter, is generally Not A Done Thing for the rest of the hoi polloi, so I take my meeting notes on paper, as well. Since I always have my Moleskine with me, it made sense for me to start keeping track of my agenda and tasks in the same place, Bullet Journal-style. I also started creating a Captain’s Log for each day in Evernote, which includes the weather forecast for the day along with anything I say in social media on that day (I have Facebook, Twitter, Instagram, Foursquare, Pinterest and all the rest plugged into my daily log via IFTTT). I have Drafts plugged into the log to add blocks of text that don’t come through any other source. I add my Fitbit report manually since its scheduling is weird, and the first step in my daily review is to scan yesterday’s Moleskine pages with my phone and add them to the end of yesterday’s log. This approach lets me keep track of everything without keeping individual track of everything – really cuts down on the save-my-tweets clutter. And finally, I switched my blogging platform from WordPress to postach.io, so I can (sporadically) blog directly from Evernote just by affixing a tag when I’m done with a post. I use Markdown for this, which works out really well, since postach.io parses Markdown directly. Could you elaborate on this, Jamie? Also, I’m curious what you think of Michael Hyatt’s new Evernote organization system, which is very tag focused. I’m looking forward to that post on your simplified notebook system. Thank you for #8 alone! Great idea for keeping track of the kids’ milestones! How’d I never think of that? Many useful tips in there as well. I’d definitely be interested in your notebook structure…mine’s gotten a little out of hand. What app are you using for your mileage (travel) logging? Also, thanks for the insight, it’s cool to see how others use Evernote. I’ve stolen some of your ideas like the Daily/Weekly/Monthly review saved searches. T-Will, I’m using an Automatic Link device and then having it update Evernote via IFTTT. I wrote a post on this a few weeks back which has all of the details. A little while back I even automated step #2 by making an applescript that creates an entry in a notebook I call “Journal”. The first post tells me what notes I created the previous day; the second script tells me what notes have been changed. I then set up a cron job on my Mac to run the scripts just after midnight. I use evernote differently too. When I first started using Evernote it was mainly for storing articles and notes from trainings and such. But over the last year I have moved almost ALL of my bill paying and financial transactions online and as I have done so, Evernote has become my repository for receipts, bill copies, bill payment logs and any kind of financial records. I am a teacher and my school is strongly adopting Google apps for education and so I’m now using Google apps more and some of the notes that used to go in Evernote now go in Google Docs for ease of sharing within that platform, however that has NOT diminished my use of Evernote as I still use it for web clippings and document storage of things I do not want in Google apps. Michel, there are two main differences that I know of. The first is the use of small dots on the page that the Document Camera uses to properly align the image, identify the page, and enhance its ability to do handwriting recognition. This is a relatively minor thing, I think. The second is the “tag” stickers. The notebook comes with stickers that you can stick on a page, and the stickers have different tag meanings. Placing a sticker on a page and then snapping a photo with the document camera, not only captures the page in Evernote, but automatically tags it. I don’t use this feature at all, but some might like the automation. Geoffrey, right now, having Evernote Business gives me more upload space each month and that allows me to do things like keep PDF version of anthologies and magazines related to my freelance work in Evernote, so I have a kind of catalog of my work in its source publication available at my fingertips. Before switching, I was beginning to get close to my monthly quota, and I shied off from uploading these other things. Now I don’t have to worry about it. Looking forward, I see some potential for better collaboration opportunities using Evernote Business, both in freelancing writing, but also in other areas of work that I do. I’m still trying to work this all out–it is definitely a work-in-progress, but when I have better idea of how I’ll be using this, you can bet I’ll post on it. Regarding Michael Hyatt’s organization: that guy is amazing, and far more organized that I could ever hope to be. I think we focus on different things when it comes to how we organize. I look for a balance between loose organization and the ability to find things quickly. I can generally find what I’m looking for in Evernote in about 5 seconds. With that being that case, why spend 10 or 20 seconds figuring out how I should tag and file a note when it only takes me 5 seconds to find it in my current loose organization? This is something that varies by individual user. There is no right or wrong way, only the best way that works for you. Erin, I love the idea of a Captain’s Log. That is awesome! Jamie, my struggles with writing have always haunted me. But now with Evernote and your inspirational post on how to effectively use Evernote will drive those nightmares away ! !